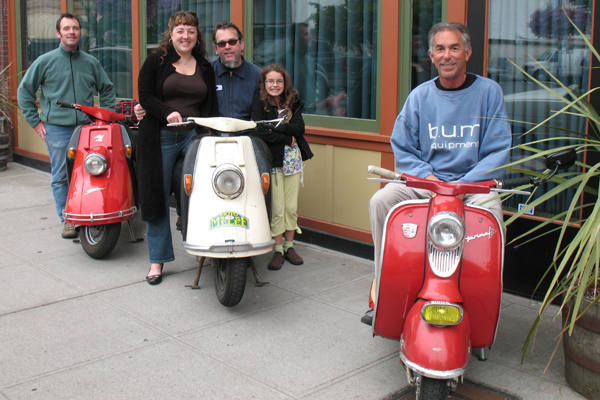 The idea for an "OddScoot" ride (scooters that are not Vespa, Lambretta or Cushman) from San Francisco to Seattle for Amerivespa 2007 originated in early September 2006, the result of e-mails between myself and Mike McWilliams in Colorado who runs the HeinkelTourist dot com web site. We put the idea forward to other folks with appropriate machinery and at one point there were as many as 8 people seriously considering the ride. Ultimately the others had to opt out for one reason or another so at the start of the journey there was only Mike and his Heinkel 103 A-1 and myself with my 103 A-2. Because of time constraints with the trip (a one-way ride) we each had our own support/chase vehicle too. Mike's wife Gretchen and daughter Leta followed our route in the rig used to haul his Heinkel to San Francisco from Colorado and my gal Deb drove a truck on loan from Craig Howell, who had been planning to make the trip with his Maicoletta, but had to cancel just before departure because of work (bummer!). 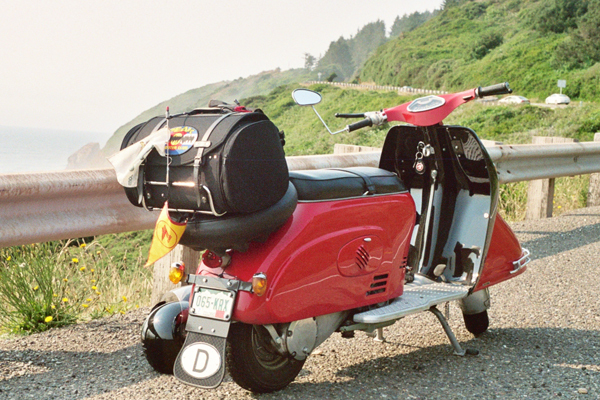 Day 1 we covered about 257 miles traveling from San Francisco to Fort Bragg, California. Our route mostly consisted of Highway 1, the Pacific Coast Highway which was cold and foggy the whole way. We stopped for lunch at the Tides Wharf & Restaurant in Bodega Bay, featured in the Hitchcock film "The Birds." 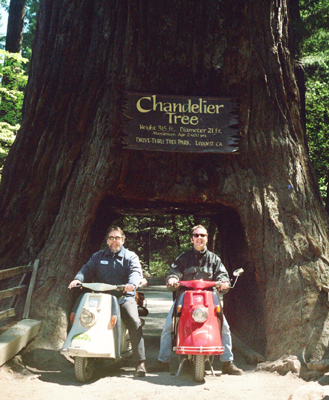 As we hit the road after lunch, we crossed paths with a large crew from Vespa Club of Los Gatos who were mainly riding 4-stroke twist'n'go scooters, but San Francisco local boy Patrick Owens was present and representing aboard his Cannonball small frame Vespa (a.k.a. "The Unstealth")! That group went straight up Highway 1 while Mike and I did a dog-leg inland on Meyer's Grade Road, Tin Barn Road, Stewart's Point-Skagg's Spring Road (a.k.a. The Best Road in the World!) and Highway 128 (which passes through Boonville and the Anderson Valley, they formerly spoke "Boontling" in these parts, a unique local dialect). The leg inland was a nice chance to warm up a bit as just a few miles from the coast the conditions were hot and sunny! 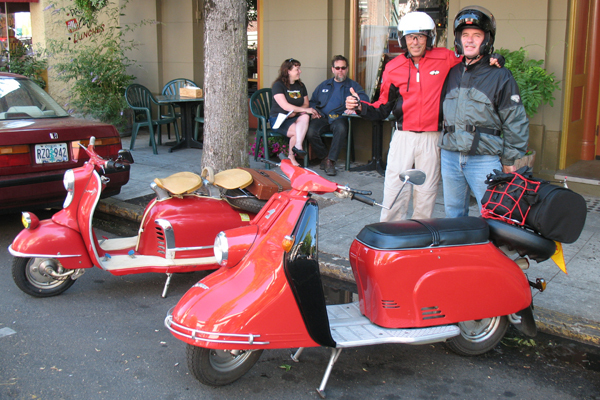 We met up with the Vespa Club of Los Gatos crew again at the end of the day's ride in Fort Bragg and enjoyed a few beers together at the North Coast Brewery's tap room, source of my favorite: Red Seal Ale. A pint or two of "cask condition" Red Seal Ale were quaffed by myself and Mike and then we headed over to our motel to meet up with the ladies for an excellent dinner at the Mendo Bistro, another of my favorites in Fort Bragg. Day 2 was also about 290 miles from Fort Bragg to Crescent City, California and again we avoided the major thoroughfares as much as possible. Avenue of the Giants parallels US-101, but is a narrow, wiggley road that runs through a Giant Sequoia grove, truly impressive! We also did a side leg through the "Lost Coast" towns of Honeydew, Petrolia, Cape Town and the Victorian village of Ferndale. I really love the Lost Coast area, it feels so remote and unspoiled! Very little road traffic in this area, too. We did a lunch stop near Eureka, California at the Samoa Cookhouse which was formerly the cafeteria of the Hammond Lumber Company, but is now open to the public. This place is cool because there's no menu, you just sit down and eat what's put in front of you. The food is good simple fare and the portions are generous. Actually they just keep bringing it until you tell 'em to stop, these guys were in the business of fueling up lumberjacks and longshoremen after all! That evening we stayed at the Curly Redwood Lodge, a motor-court style motel built in 1957 from a single Redwood tree that yielded 57,000 board feet of curly-grained lumber. The place is so well preserved that you'd think it was still the 50's except for the color TVs in the rooms, a real time-warp! Each room had it's own carport, too. Of course Mike and I both placed our Heinkels in the spot of honor! Day 3 was the mega-mileage day with 339 miles to cover, mostly in a run straight up US Highway 101, from Crescent City to McMinnville, Oregon. It was also the day of mechanical trouble for me! 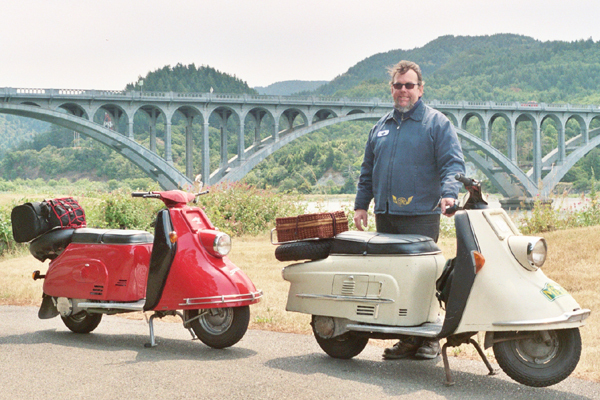 Somewhere North of Gold Beach, Oregon on a fast stretch of highway my Heinkel began to loose power at full throttle as if it were starved for fuel, but would recover somewhat if I backed off the throttle a bit. No problem, we pulled over and I poped the carb off to see if any of the jets were blocked. Never found the offending "speck", but when I was reinstalling the jet block I felt it begin to tighten up then the carb the body stripped out! This turn of events seemed to pretty much spell the end of my whole ride right then and there. I'm not a fan of cell phones, but in this instance it was fortunate Mike had one with him and gave my support crew (Deb) a call. She was about 15 minutes behind us and this was lucky because the previous two days the girls had been hunting antiques along the main routes while Mike and I were exploring the remote backroads. Mike asked what my next move would be and I told him that when Deb arrived I would call a friend with a couple of Heinkels back in San Francisco and ask him to send a carb to our hotel. Mike then proffered that he had several Heinkels in his garage back home in Colorado and maybe he could get somebody to pull a carb off of one and overnight it to our hotel. A single phone call later, before my scoot was even loaded into the sag wagon, and the repair part was on the way! An example of a rare moment when I was glad there was a mobile phone handy. So I spent the remainder of that day, about 200 miles in the truck with Deb. It was a bummer that I missed that leg of the ride, but at least the company was good! We got to the Hotel Oregon in McMinnville just before sunset and my friend Beall Korry from Seattle was there with his NSU Prima to join us for the last 2 days of the ride. My friends Heintz and Julie from Portland had riden to the hotel on their /5 BMW to join us for the evening as well, so it was a fairly festive atmosphere. The Hotel Oregon is another of the many cool places we stayed at during the trip. 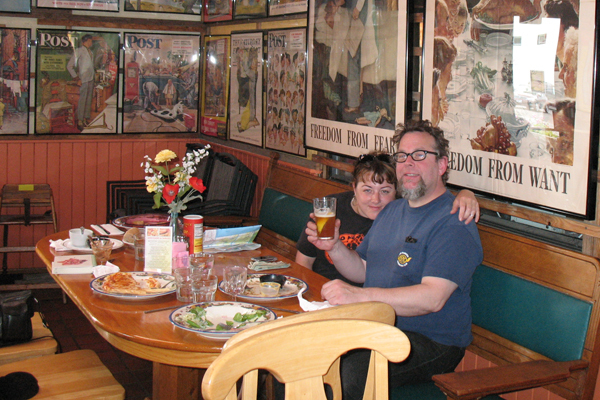 Run by a micro-brew outfit called McMenamins that originated in Portland, they have several Brew Pub locations scattered throughout the Pacific Northwest as well as 7 locations that are combo Brewery/Inn establishments. All of the hotels are historic buildings that have been saved from certain destruction and then subjected to a very high-end restoration. There are hand painted murals adorning much of the building interior, including guest rooms, depicting persons significant to the history of the site and fun facts to know and tell about these folks, too. The Hotel Oregon is a magnificent 4-story brick building right in the center of McMinnville. Deb and I joined Heintz and Julie at the rooftop bar to enjoy a quick beer and the sunset while Mike, Gretchen and Leta got settled into their room. Afterward the whole gang convened in the street level pub for a little dinner, a few beers and a bit of catching up with the folks from Oregon and Washington who had joined us. Day 4 Mike and Beall set off on a route of apporximately 218 miles to our next destination, The Olympic Hotel & Theater in Centralia, Washington, another McMenamins Brewery/Inn. I, on the other hand had an unknown amount of time to kill waiting for the replacement carb to show up theoretically sometime before 3pm. As luck would have it Howard Hughes' famed gigantic flying boat the "Spruce Goose" is located in McMinnville and I had been wanting to view this marvel for years. The Spruce Goose was formerly on display in Long Beach, California next to the giant ship Queen Mary. I used to visit Long Beach frequently to see my dad, who lived there for about 15 years until his retirement about 5 or 6 years ago. I had been interested in checking out the Spruce Goose from the begining, but always put it off "for the next trip" until one holiday visit when I learned that it was gone from Long Beach for good! Well, I finally got to see the ole Spruce Goose and she seems to be prospering. The aviation museum in McMinnville is an impressive facility with 30 to 50 aircraft of all sorts on display including an SR-71 Blackbird. The whole space is totally dominated by the Spruce Goose and several sizeable aircraft including the SR-71 are parked under her wings! Spent a pleasant couple of hours with Deb, Gretchen and Leta wandering the museum and about the time we had worked our way through the place the hotel concierge called Deb to say that our package had arrived! Hot footed it back to the hotel to retrieve the carb then found a nice shady spot on the side of the road to install it. About 20 minutes later everything was back together and my scoot was running sweet again! On the road about 1pm, I was 3 hours behind Mike and Beall and not sure if I would have time to do the whole route for the day. Deb was following pretty close behind me (Mike's girls had opted to blast up the I-5 superslab as Gretchen in not a big fan of twisty backroads) and I figured the two of us would stop for lunch somewhere along the way which would result in a need to abbrevate the route, but we got separated in a cluster-f**k of a roundabout at the center of Longview, Washington. At that point I decided to just bomb the remainder of the route with no lunch stop. Rolled up to The Olympic Club Hotel shortly after 6pm and Mike and Beall were out in front with their scooters when I arrived. Turns out they had rolled in only a few minutes before me! They had enjoyed a long leisurely lunch stop, a couple of espresso breaks and I guess Beall "Wrong Way" Korry had accidently taken them off the route, even though he had laid it out himself, and it took the two of them a while to realize and get back on course. No worries, we all made it to the hotel and had a good time doing it too! The gals arrived and we enjoyed an evening of McMenamins hospitality in another super-cool restored hotel with an interesting history. After dinner we wandered over to the Centralia train station which has been recently restored and we walked the length of the main drag to check out all the interesing shops and store fronts in downtown Centralia, then off to bed. Day 5 Mike, Beall and I got a reasonably early start on this morning, but the clutch of Beall's NSU began to slip badly as soon as we took off. 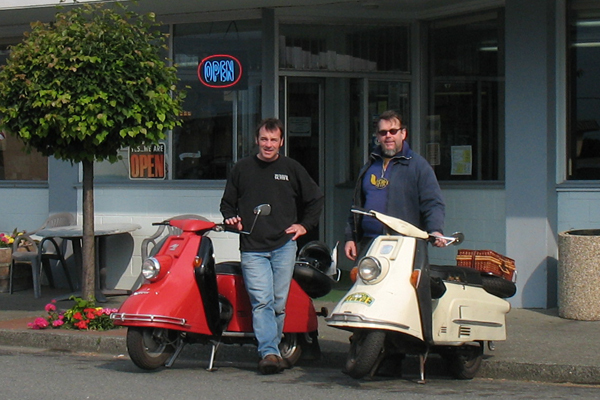 We made it about a mile down the road, then stopped at a gas station to check that the clutch adjustments were all OK. No external problem was apparent and even though the clutch had functioned perfectly the previous day it was now in no condition for the 169 mile ride into Seattle. Beall limped back to the hotel to put his scoot in the truck and ride with Deb while Mike and I pressed on. It seems that the Gremlins had decreed "No more than 2 shall ride together on the Rollertour!" 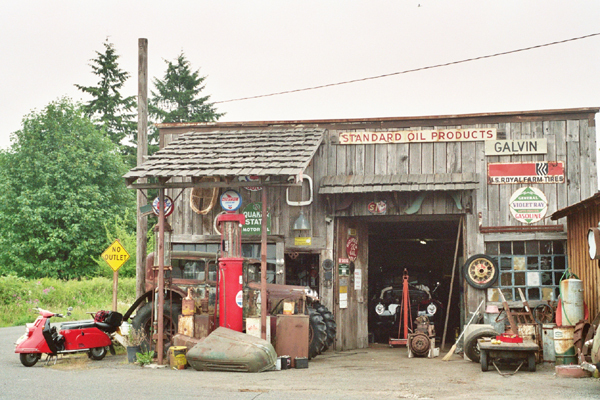 Shortly after Mike and I had escaped the built up area around Centralia, at at spot identified on the map as "Galvin" we ran across a super-cool old car garage. The place was an "old car garage" in a couple of senses, the building was an old gas station covered with porcelain enamel signs, antique gas pumps, etc. and the only cars in evidence were pre-war Ford cars and trucks, the most eye-catching of which was an early 1930's sedan fitted with tractor wheels and tires on all four corners and a small sign on the front bumper proclaiming "Let it Snow!" Of course we had to stop and check this out!! The proprietor was a gentleman of approximately retirement age and while we took some snaps of his old cars he got out his camera and shot a few photos of our Heinkels for his collection. Then he gave us a tour of his museum, a building located across the street from the garage that had 25 to 30 pre-war Ford cars and trucks packed into it, mostly in restored condition with a few still awaiting work. A pretty interesting place to randomly come across out in the woods of central Washington! We concluded our visit and continued on. Our route was taking us toward Olympia on various backroads that paralleled I-5 roughly 5 miles to the West. We intersected US-101 on the outskirts of Western Olympia and it was here that I had my own "Wrong Way" moment. Rather than getting on US-101 as per Beall's route instructions I elected to take a surface street, Old Highway 410 which seemed to parallel the freeway. What I failed to realize though, was US-101 split off and headed North at a point where we didn't have a line of sight to the freeway and we were actually following State Route 8 due West for Grays Harbor. I started to have "that feeling" so we stopped and I got a map out. Fortunately we were at a spot where we could easily get back on track and my little detour only added about 25 miles to our route! Mike and I were both feeling a bit peckish at this point so we stopped at a roadside barbeque stand that was housed in a vintage "canned ham" style trailer and had a horizontal barbeque pit done up to look like a pig, complete with pink paint job, a curly tail and all! About the time our pulled pork sandwiches were ready Deb and Beall rolled into the parking lot and joined us for lunch. From there the route took us along the shore of Hood Canal then around the Port Orchard waterfront to the Fauntleroy-Southworth terminal for the ferry into Seattle and the end of our journey. It was a bittersweet moment for me during the boat ride across Puget Sound as I was glad to have reached the destination, but also a little sad that there would be no more days of exploring the backroads aboard my Heinkel... at least not on THIS trip! 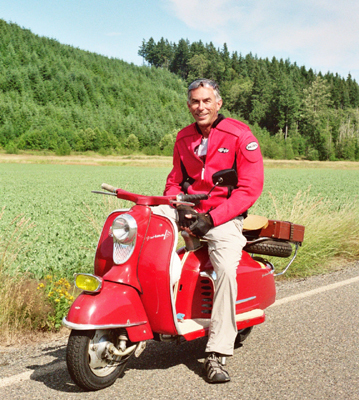 Many thanks to Harley Welch for the story and the Mike from HeinkelTourist dot com for the images!